Heartbroken on a Thankful Thursday | Season It Already! Posted on October 30, 2014 by Carrie @ Season It Already! I thought that the past week had been rough. As I was leaving work on Friday, my computer crashed. And I couldn’t reboot it. My boss was gone and all I kept worrying was that I had done something wrong to cause it. I worried about it all weekend long. I am thankful for my husband, who, after hearing the details of how it happened, tried to console me, explaining how it wasn’t my fault. I am thankful for my friend Stacy, who not only said the same thing when I went to see her on Saturday night, but also gave me the best distraction – catching up! I am thankful for the best night of sleep I’ve had in a really long time at her place. It was much needed. And when I returned to work Monday, Rob and Stacy were right. It wasn’t my fault. I am thankful that we finally hired an I.T. guy about a month ago and that he could diagnose the problem: My hard drive was dead. I am thankful that I had backed my computer up on Friday about a half hour before my computer crashed. But I was still sick to my stomach. It took three days to get my computer back up and running. I feared that I wouldn’t be able to pay our employees on time. But in the end, was able to get everything taken care of late yesterday. But the anxiety of it all exhausted me. But all of that worry seems so silly now. Because this morning, I received news that one of my cousins passed away. He was in his early 30s. I am just so sad. I hadn’t seen my little cousin Danny (as he will forever be known to me) in several years. But I am thankful for Facebook for connecting me with so many family members, like Danny, that I don’t see very often. I am thankful to see photos of their families and hear what’s going on their lives. It at least makes me feel a little closer. I am heartbroken for his daughter, my aunt and Danny’s brothers. It was just a couple of weeks ago that I was telling my mom how great it was to see the three brothers become so close. Their interactions on Facebook with each other had shown me that. My mom had noticed it, too. I am thankful that the boys had the opportunity to become close. I remember that they were little hellians and could cause so much trouble together as kids! I sure hope that they hold those memories close, too. During these times, it’s hard being away from family. We think of them all more and we want to squeeze them a little more tightly and hold them a little more closely. I am thankful to have such a large, loving extended family. I really do love have so many cousins. Even if I haven’t seen some of them in years, we always have that connection. We’re family. As I watched comments begin to fill his Facebook page, I began to wonder what the true netiquette is when it comes to death. But then I remembered that people deal with grief in very, very different ways. There are some truly kind comments posted that pay tribute to my cousin. For some people, commenting can be a way of showing respect or honoring the person who passed. For others, it’s a form of closure or a way of saying good-bye. For me, I’m given the chance to get to know the side of my cousin I haven’t seen for the last several years and smile knowing he touched the hearts of so many. I am thankful for that. And then, I questioned myself how appropriate it is to blog about this? Although my blog is public, I write it for myself. And I find writing cathartic, especially since I started letting go of worrying about grammatical errors. For the most part, I write more about how I feel without worrying about perfecting the text. I am thankful for that. Tonight, I have a painting class. 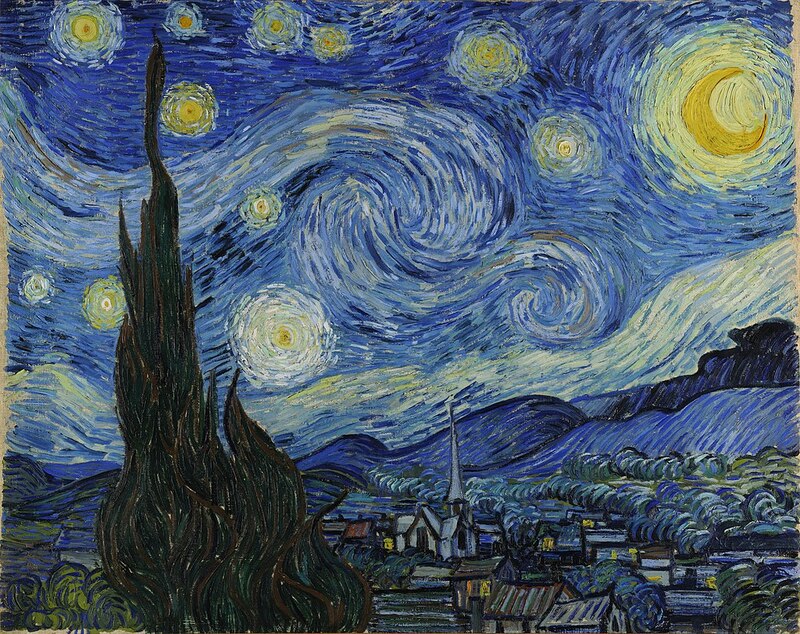 We will be painting Van Gogh’s Starry Night. I have a feeling it’s going to be an emotional piece. Please, Rest in Peace, my dear cousin. You will be missed. You have such a great attitude – being thankful about things. I am sorry for your loss.